Mike Moore | The Journal Gazette Artur Tyanulin, left, shooting the puck at Memorial Coliseum, where he could play this season as a member of the Brampton Beast. Artur Tyanulin, who was an all-star last season with the Komets, has signed with the ECHL’s Brampton Beast. 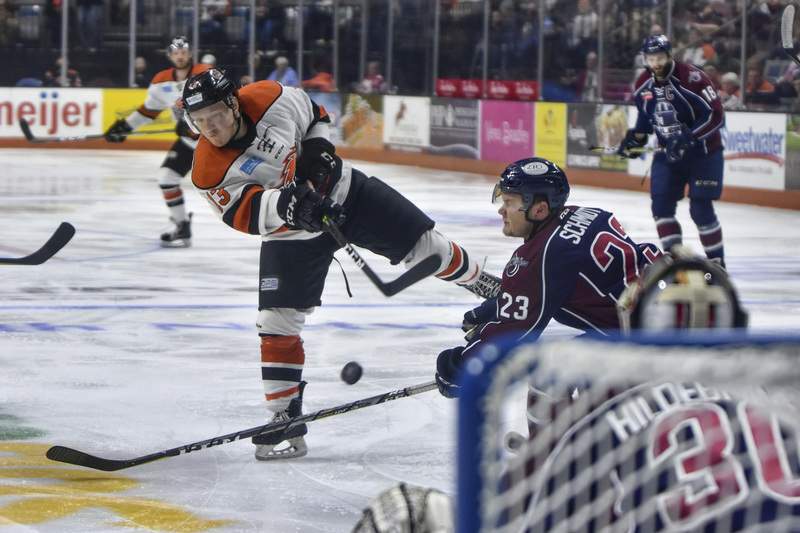 Tyanulin, 21, had 18 goals and 42 points in 39 regular-season games with the Komets, then added three goals and five points in 11 playoff games. He also skated eight games with Tucson of the higher-level American Hockey League and had an assist. The Komets didn’t have his rights because he had been property of the NHL’s Arizona Coyotes. “Artur is a highly-skilled forward that has a great combination of speed and offensive playmaking abilities. Our objective as a coaching staff is to help him establish himself as a regular and top-end player,” Beast manager of hockey operations Frederic Lemay said in a press release.